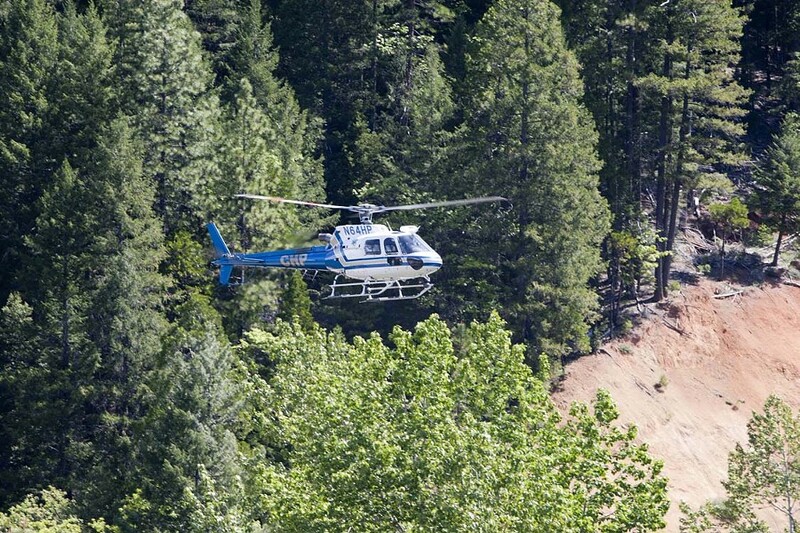 Photo by Preston Drake Hillyard A CHP helicopter searches for Sophia. 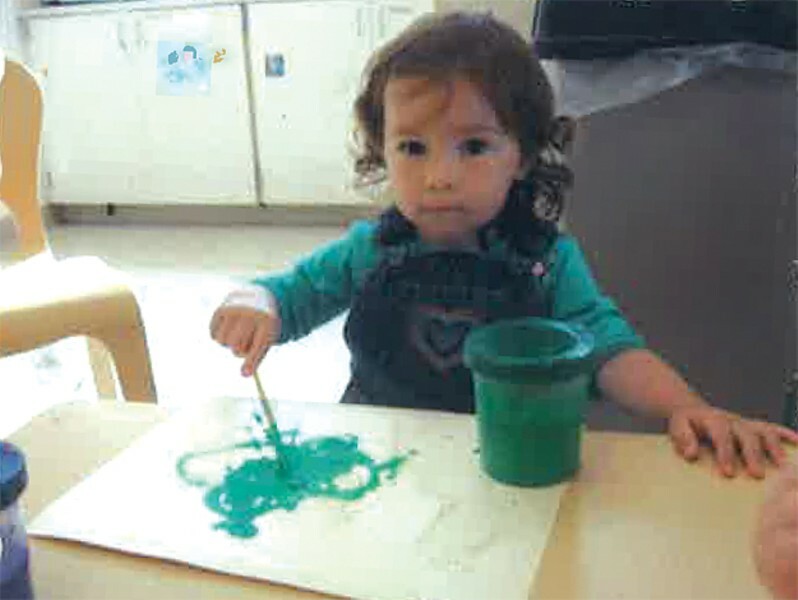 Photos courtesy of Robert Parker a picture of Sophia painting that was circulated during the 29-hour search for her. Robert Parker stood before a small group of reporters, his round shoulders slumped at his sides and his brow knitted in misery. "I'm Robert Parker," he said in a quavering voice. "I'm Sophia's father. I'm Claudia's husband." He lowered his head and squeezed his eyes shut. The 47-year-old Parker, a tall, unassuming man with close-cropped dark hair turned gray on the sides, was standing in a sun-drenched corridor of the Trinity County Courthouse in Weaverville. Moments earlier, in a nearby courtroom, his wife had been arraigned for murdering 2 1/2-year-old Sophia, the couple's only child. According to the Trinity County Sheriff's Office, Claudia Parker Pedreros, 30, had been found four days earlier walking naked down rural Hwy. 3 north of Coffee Creek, a tributary of the Trinity River. Initially she told sheriff's deputies that she didn't have a daughter, was unmarried and had no idea how she'd arrived in northern Trinity County, 130 miles from her McKinleyville home. But when Sophia's body was found in the Trinity River the following day, Claudia allegedly confessed to drowning her daughter and releasing her body to the currents. Robert Parker's chin trembled as he continued. "I have a written statement here to say, because it's kind of hard to keep my thoughts together sometimes... ." He closed his eyes again. "This is a time of really profound hardship for ... for everyone involved, and for especially my family. And it's impossible ... it's impossible to express in words ... the loss ... the loss that we feel right now." He struggled through the statement, voice hitching repeatedly as he lamented the loss of his "remarkably beautiful and brave little girl" and thanked the search and rescue teams that had scoured two counties for her. "[T]his is an extremely difficult time for my whole family," he said, "and especially for my wife Claudia, who has not only lost her child but is now in custody... ."
It's all but impossible to comprehend a tragedy of these dimensions, yet our minds persist in trying. Like some horrific optical illusion, such crimes simply don't square with the world as we understand it. So we stare. We feel uneasy. We try to explain it away. In online comments posted below the gut-wrenching news stories, readers suggested that Claudia must have been on drugs. But she wasn't. Blood tests came back negative for narcotics. Maybe she was being abused, others suggested. Maybe someone else killed Sophia. Residents from Claudia's native country of Chile chimed in with their own theories, tinged with suggestions of cultural persecution. Even the revelation by Claudia's lawyer that his client has a history of mental illness did little to assuage the public's bewilderment. How could a mother kill her own child? And then you had Robert Parker -- a man whose wife stood accused of murdering their baby girl -- requesting sympathy for Claudia. For her especially. How do we make sense of that? The case against Claudia Parker Pedreros has been put on hold until July 6 pending two independent psychological examinations to determine whether she's mentally competent to stand trial. Last Thursday a memorial for Sophia was held on the campus of Humboldt State University, where her parents often took her for daycare. The next morning, Robert Parker sent a letter to the Journal, which he asked us to publish (see sidebar). When we contacted him to confirm that he sent the letter (as is the Journal's standard practice), he opened up about his wife and their late daughter. In a series of phone conversations over the next few days Parker recounted their story -- from his chance encounter with a beautiful young woman in the streets of Puerto Montt, Chile, to their continent-hopping romance, their Chilean wedding and the birth of their daughter, Sophia. And tenderly, gingerly, he spoke about the shattering tragedy that he, too, is struggling to comprehend. This is the story he told. For nearly 20 years, Robert Parker lived a life that most people would envy, "the life of adventure and travel," as he put it. In the early 1990s he worked as a whitewater rafting guide on the rivers of the Sierra Nevada. In 1998 he transitioned to fly fishing, guiding expeditions in Montana, Alaska and Chile, a country internationally renowned as a fly-fishing destination. While walking through the streets of the coastal city of Puerto Montt one day in January of 2000, Parker encountered a pretty, freckle-faced 19-year-old Chilean woman named Claudia Pedreros. They chatted over coffee, Parker sometimes flipping though his Spanish-English dictionary to find a mysterious word (he'd learned Spanish from a book-and-CD study system, but the local dialect occasionally stumped him). Afterward she gave him her number. The next morning, after a ferry Parker had planned to take through the southern channels was unexpectedly delayed, he called her up. They met for lunch and spent the rest of the day together. "I literally just fell in love with her that day...," Parker said. "I don't think I've ever met anyone in my life who had such an open heart as hers. She is just incredible in that way." Over the next two months, as Parker fished, rafted and backpacked through southern Chile and Argentina, he sent letters and postcards to Claudia back in Puerto Montt. Unfortunately, the postal system in rural South America leaves a lot to be desired: When Parker finally returned to the coastal town, he immediately called Claudia and asked if she'd gotten his letters. "What letters?" she asked. She'd received none of them and assumed she'd never see Parker again. "Where are you?" she asked. "Don't move. I'll be there in 15 minutes." That evening she introduced him to her parents. "We've been together ever since that day," Parker said. Shortly thereafter, Parker decided it was time to set up his own operation. He developed a business plan and in 2001 established a fly-fishing-outfitter operation in Puerto Montt. Over the next seven years he and Claudia traveled back and forth between the northern and southern hemispheres, following the seasons and the tourists. When it was summer in the northern hemisphere they lived in Yellowstone National Park -- he worked at a local fly shop and, during their second season in Montana, she found work as a housekeeper at a lodge. "We spent our days fishing, traveling in the park, hiking, sitting and watching the wolf packs," Parker said. When the weather cooled down they'd go back to Chile, where Parker's outfitter business brought in enough income to support their lifestyle, though not much more. The two were married in a church in Puerto Montt on Nov. 27, 2004. Claudia got her green card, and she aspired to someday take the U.S. citizenship test. Parker suddenly stopped talking. He was getting a call on the other line. "Could I call you right back?" he said. "I think that's her calling, actually." It was Claudia. She was calling from the Trinity County jail. Twenty minutes later, Parker called back. The phone system from jail is difficult and expensive, he said. He'd had four phone conversations with his wife since her arrest. And he's allowed to visit her twice a week for an hour and a half per visit. Technically those conversations are on the phone, too, though they can see each other through the glass. "Going back to Montana really quickly...," Parker said, changing the subject. After lamenting the difficulty of communicating with his incarcerated wife he seemed eager to dive back into their idyllic past. His voice grew calm and whimsical. Even when he arrived at memories of his daughter, he sounded not mournful but soothed. He was in Chile when he got the phone call, and somehow he knew as soon as it rang. "I said to myself, 'It's Claudia and she's pregnant,'" Parker recalled. It was February 2008. Parker was in South America wrapping up their affairs; Claudia was still in the states. They'd sold the fly-fishing business and moved to Humboldt County so that Parker could finish his Bachelor's degree in fisheries biology (a pursuit he'd begun before meeting Claudia), and to take care of his aging father. Parker, joyous at the news that he would be a father, returned to the U.S., where they continued traveling and fly fishing through Claudia's pregnancy. In the fall, Parker started classes at HSU. Sophia Parker Pedreros was born on Sept. 16, 2008. "I remember just the three of us in the delivery room at Mad River Hospital," Parker said. "Sophia's little hand was just wrapped around one of my fingers." He recalled other memories of Sophia -- throwing her leg up on the couch and climbing it before she could walk; proudly singing her ABCs; surprising herself by dropping down the slide at Bounce-a-palooza in the Bayshore Mall. "She was a really, really intelligent little girl," Parker said. Parker's voice maintained a calm determination as he led into the events of May 20. And here he made the first allusions to his wife's mental health issues. He was on his way to Reno when things began to unravel. He'd just graduated from HSU and was preparing to do field research before transferring to the University of Nevada, Reno for his Master's. Before he left, he said, he'd sat down with Claudia to discuss some things. "I told her, 'We have done this before. There have been times where I have been away to work. We've always managed to get through it.'" Shortly before arriving in Reno on the evening of Thursday, May 19, Parker called his house and spoke with his 82-year-old father, who moved in with them last year. He also talked to Claudia and Sophia briefly, then hung up, having no idea that he'd heard his daughter's voice for the last time. At 5:40 the following morning Parker was awakened by his cell phone. He didn't recognize the number, so he ignored it. Five minutes later it rang again. He answered. It was a man in Willow Creek saying that he'd found a dog -- the Parker family's wire fox terrier named Pelusa (a Chilean slang term for fuzzball) -- and called the number on the tag. Parker was confused. How had his dog gotten to Willow Creek? The man agreed to hold on to Pelusa while Parker found someone to come pick her up. For the next two hours he tried repeatedly to reach his dad and Claudia, to no avail. He left a message for his father at Sun Valley Floral Farms, where the elder Parker works two days a week as a security guard for the firm Securitas. At 8:05 his dad called him back and said that Claudia, Sophia and the dog had disappeared, along with the family's 2008 silver Kia sedan, sometime after 2 a.m., when he'd seen Claudia reading a book in the living room. "I started to get really, very concerned at that point," Parker said. "I told him to hang up the phone, call the police -- call 911 -- and report Claudia missing with her daughter and report the car stolen." Clearly, something is missing from this narrative. What did Parker know that made him so immediately and acutely concerned? He wouldn't say. "Those are issues that I think are all well-documented with the appropriate authorities and providers and really relate heavily to Claudia's upcoming legal case," he said. In a later conversation we asked Parker if he ever had reason to believe Claudia might harm Sophia. "During the course of our relationship? I would rather not comment on that at this point," he said. "I think that's something that's integral to the case that's about to come up." At any rate, Parker's father called the police. Less than an hour later, the Trinity County Sheriff's Office located Claudia walking naked down Hwy. 3. Her responses to deputies' questions led them to conclude that she had either mental health issues or was under the influence of some type of narcotics, according to a press release from the Humboldt County Sheriff's Office. Since she couldn't recall having a daughter, the search for Sophia continued without her assistance. Shortly after 9 a.m., Parker got a call from the California Highway Patrol informing him that his wife had been found but his daughter had not. He got into his car and started driving toward Trinity County. Between Reno and Susanville he received calls from the CHP and Trinity County Sheriff's Office asking if he'd be willing to get flown in to help with the search. The CHP pilot met Parker in Susanville and flew him to Trinity County, where the search for Sophia continued. "At that point, I would like to cut that time line off," Parker said. "because it gets into issues of the legal pending case." He wanted to add one thing -- and it was a refrain that he repeated several more times, with very little variation, during subsequent conversations: "I know very very deep in my heart that my wife ... is not consciously capable of harming our daughter," he said. "As to what happened from there, I think it's most appropriate for the psychologists and the courts to make the decisions." On the afternoon of May 20, while the search for Sophia continued, Humboldt County Sheriff's deputies searched the Parker-Pedreros house and found a number of curious things. Kitchen knives had been removed from a drawer and placed throughout the house, according to Sgt. Wayne Hanson. Sophia's bed had been stripped to the mattress. A small trashcan by the front door contained more kitchen knives and, floating in a pool of water at the bottom, important family documents including Social Security cards and passports, Hanson said. Meanwhile, search-and-rescue efforts were escalating. By Friday evening the efforts included the California Highway Patrol, Sheriff's deputies from four counties, the National Center for Missing and Exploited Children and countless concerned citizens. Claudia's driver's license and cell phone were found near a portable restroom in Willow Creek. Trinity County Sheriff's deputies discovered a trail of items strewn along Hwy. 299 and Hwy. 3. The items, which included CDs and children's toys, had apparently been thrown from the car window or, in some cases, set down in piles, Hanson said. The search continued through the evening and resumed the following morning, with law enforcement agents, concerned citizens, helicopters and police dogs combing every inch of Claudia's known path. Parker said that throughout the frantic 29-hour search, he expected Sophia to be found alive. At around 1:20 p.m. on Saturday, May 21, Trinity County Sheriff's officers found her body tangled in submerged vegetation in the Trinity River north of Coffee Creek. The bedding that had been removed from Sophia's mattress was found nearby, Hanson said. Spanish-fluent special agents from the FBI and the California Dept. of Justice were brought in to interview Claudia. During the interview, she admitted to drowning Sophia and releasing her body in the river, Trinity County Sheriff Bruce Haney said the following day. Claudia was booked into the Trinity County jail and charged with murder, child cruelty and related enhancements. "In the first days after this it was very much like living in this waking nightmare," Parker said. "Literally I woke up every morning and was not able to realize where I was." He had to walk to Sophia's bedroom and see it empty before the sickening reality would sink in. And when it did, he said, it caused "some pretty horrible physiological reactions that I don't even really want to go into -- just a pain coming from a place that I did not even know existed." Following Claudia's arraignment, her lawyer, Arcata attorney Russell Clanton, characterized Sophia's death as "a tragic accident" and said there is physical evidence to support that claim. But he also acknowledged that Claudia has a history of mental health problems. "It's clear that those problems are part of this case," he said. Parker said essentially the same thing: "[T]here may be an element of mental illness involved. ... I think it's pretty obvious that that may have played a role here." At Sophia's memorial he urged compassion and understanding for women suffering from postpartum depression and postpartum psychosis. In our conversations he again addressed the stigma associated with mental illness and suggested that our culture needs to look analytically at root causes to prevent such heinous events. "I don't want to see something like this ever happen to another child again," he said. Of course, compassion for those suffering mental health problems is one thing; extending that sympathy to a woman who allegedly killed your daughter - even if that woman is your wife - well, that's another matter. Yet Parker remains steadfast. "I feel nothing but love and compassion for my wife," he said. So if she's not to blame, who is? Does Parker question whether he might have prevented Sophia's death? "I've done a lot of soul searching and a lot of grieving, and I've spent a lot of time in prayer over the past weeks -- I mean, more than I ever thought was really possible," he said. Ultimately he decided that blame and anger are dangerous games. "There's nothing I or anyone can do at this point that will bring Sophia back to us. I've come to that hard realization." Nonetheless, he also realizes, even in the midst of his grief, that it's not that simple. "I know that I'll probably be questioning myself for the rest of my life," he said. As Claudia awaits her next hearing on July 6, when psychologists will give their opinions on her competency to stand trial, Parker plans to continue his twice-weekly trips to Weaverville to visit her in jail. And he'll speak to her on the phone whenever she's allowed access. Some of her Chilean family members have obtained travel visas; Parker expects them to arrive sometime this week. Together they'll hold a private family memorial for Sophia. For Parker, the events of the last few weeks haven't changed his feelings toward Claudia. Theirs is a love story. Asked how he can remain so devoted in light of what's happened, he didn't hesitate. "I made a vow to her on our wedding day, and I plan on sticking by that vow," he said. "Plain and simple as that."